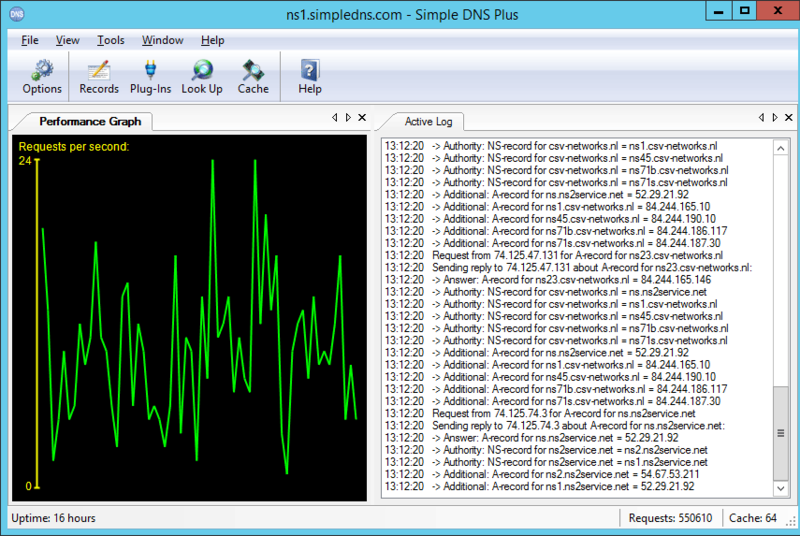 What makes Simple DNS Plus "simple" is its user interface and automation features. All options and settings are available directly from the intuitive Windows user interface. It provides wizards for common tasks such as setting up new zones, importing data, making bulk updates, etc. You never need to mess with cryptic configuration files or registry settings. Novice users can have their DNS server up and running correctly and securely in no time. But make no mistake - Simple DNS Plus is a very capable and full featured DNS server, and it has plenty of options for expert users to tweak it just the way they want. Simple DNS Plus runs on all client and server versions of Windows XP/2003 up to current versions. Simple DNS Plus has a REST / JSON based HTTP API for easy integration with your web-site, applications, etc. There is a long list of plug-ins available to provide extended functionality - including a DHCP server. Simple DNS Plus even makes DNSSEC simple, with automatic DNSSEC signing whenever you change DNS records, automatic key rollovers at scheduled intervals, etc. We've been a SimpleDNS customer for quite awhile and I can tell you there isn't a better DNS Solution on the market with as clean and stable an installation as SimpleDNS. Download a free 14 day evaluation version now!